Maybe it’s the almost oppressive string of wet, grey and bitingly cold weather we’re having, but I appear to have contracted Bootitis. Bootisis: An affliction frequently contracted during the winter months, predominantly by females in their 30s. Symptoms include: severe aversion to cold feet (for conditions including fears of covering feet up, see Havaianaitis, an affliction mostly contracted by females aged 13-27); unbridled horror of rain seeping into one’s shoes; and desire to keep the lower extremities warm and protected regardless of choice of bottom-half clothing. Often co-morbid with psychological condition ObsShopitis, whereby females of the affected age group develop an obsession with chosen item, frequently stalking it online, comparing prices and postage, and scheming to get to said shop as soon as possible despite potential intereferences such as work. You’ll recall I bought a pair of Berlins (sadly no longer available so no linky) from Betts, my chosen purveyor of boots, and loved the wooden heel that produced a very satisfying clunk when I walked. I also considered the Magiks but progressing pregnancy made the future Sensible Mum in me choose the lower heels. 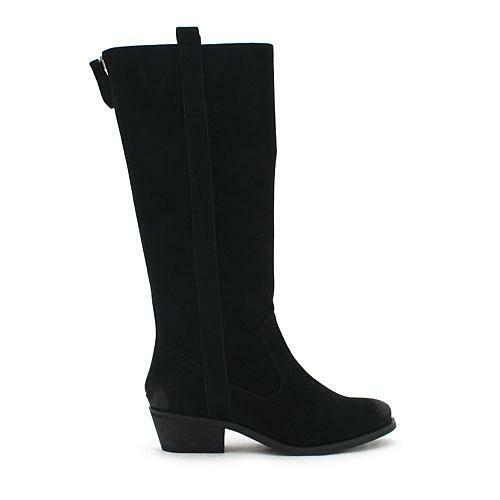 Sensible Mum also directed me towards this pair of Drifters, which unlike my other pair of black suede-y knee-highs, are less of an equestrian boot and more of an urban stroller. 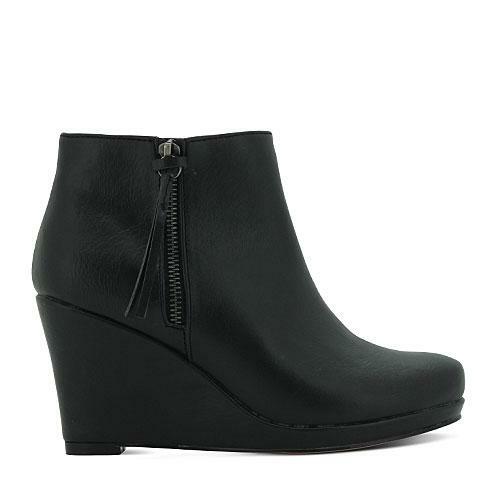 These thankfully zip up over jeans (I don’t mind when boots don’t zip up over jeans because I have firm runners’ calves; I do mind when it’s because I have soft unexercised flabbos), and are delicate enough around the toe to look girlish not farmerish (while leaving enough space for my wide feet). They also come in a neutral colour. So I thought that was it – two pairs for winter; one short and one long; one brown and one black. Sensible Mum was happy. Yummy Mummy was not. I couldn’t stop thinking about the Magiks, which had the same wooden heel I loved and had been so comfortable and added a good few inches to my height. Due to a mistake by the shopgirl (which realised too late and would normally point out, but dealing with her extreme incompetence , even while observed by two senior staff members, disengagement and sulkiness made me think I truly deserved a reward for putting up with eye-rollingly poor customer service), I got them for $75. Score! But Yummy Mummy and her friend Slightly Tacky Mummy conspired to make Sensible Mum realise that she also needed to replace her main pair of work shoes, which I realised last week are at the Julia Roberts in Pretty Woman (pre-Richard) stage of disrepair, needing significant amounts of black texta to cover up all the scuff marks. Surely a pair of boots would be the most sensible replacement at this point? I have to admit that I (and Slightly Tacky Mummy) are a sucker for a wedge. They are stable and comfortable while providing the lift that we all – including ex-President Sarkozy – so desperately want. Wedged boots, however, are borderline. I have seen the good, the bad and the ugly, and really think that the way in which they are worn makes or breaks them. I tried on these Plutos in-store when I bought the Magiks. I left after I tried them on, needing to wrestle with my conscience a bit, but as I thought about them repeatedly, and resorted to web-stalking, I knew that my subconscious was heavily infected with Bootitis and I was ready to purchase. I am worried that the heel with also scuff, but hey ho, work shoes are meant for hard wear. I’m not so much a fan of the platform at the front, but they’re not too high, nicely cushioned inside, and the roundness doesn’t squish any toes. They’re plain enough not to attract attention, and I think under black skinny jeans they could be made to work. In any case, they’ll be workhorses under my usual work attire of black or grey pants (plus tops! I wear tops to work! ), so I’m really quite happy with them. However, I will complain about Betts’ online ordering – there isn’t any! Every single thing I have looked at has virtually no sizes left and advises you to call in-store. This is pretty slack I think, seeing as each store can only advise you of their own stock and can’t post anything to you. It seems to be an online store that only serves to direct you to bricks and mortar stores and expects you to call around until you chance upon what you’re looking for, and makes it devilishly difficult to purchase anything. I thought I’d save another trip and order the Plutos online, but there wasn’t a single size available. I rang a store closest to work hoping I could dash out at lunch time, but they didn’t carry it, and in the end called my local store, paid over the phone, and have prevailed upon my obliging sister who works nearby to see if she can pick them up after work tomorrow, as she finishes earlier than I do. A bit too much effort, Betts. But there you have it – a case study of Bootitis at its worse. At least the total damage bill came to less than one good pair of leather boots, and I feel well-equipped to brave the long and splashy walk to the station each morning. Now to find some waterproofer! One of the biggest sartorial challenges for the style-conscious vegan is footwear, and in particular, boots. Once you eliminate leather, nubuck and suede, you also eliminate the best designs and quality. Alack and alas, I shall never own a pair of Hermes riding boots. I feel like I should hashtag this #firstworldproblems. With winter upon us (and today’s weather is particularly vile), and The Bunny making me less and less inclined to wear heels as my centre of gravity tips ever forward, I wanted to find a pair of low-ish boots for wearing on weekends when my Converse feel too casual. Searching out animal-friendly footwear often leads me to find myself in shoe shops that, if they were equivalent clothes shops, I would never enter. Imagine the Supre of shoes. Not really my demographic. However, I have had frequent successes with Betts. They have a big range, plenty of non-leather, and the sales are pretty darn generous too. I have a couple of key requirements when it comes to boots. Firstly, the material must be ‘good’ – not that plasticy, shiny thin stuff. I don’t want to look like I’ve clingwrapped my calves. Secondly, I hate those plastic heels that are made to look like a proper stacked heel. I want a proper stacked heel of proper solid …well I don’t know what, but not plastic with pixelated prints on them! 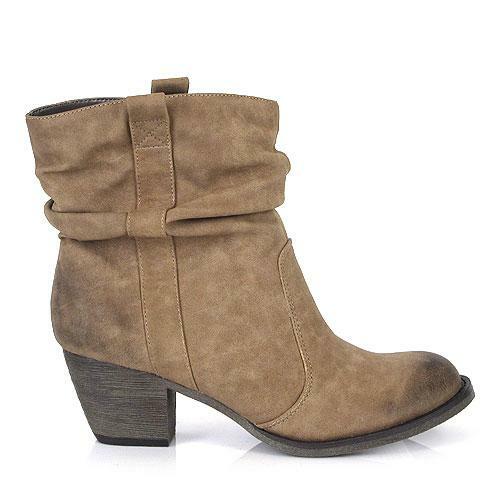 I can’t find an exact picture of the boots I bought, but imagine these ‘Roustabouts‘ with a lower, more cowboy-y heel. Love the side zips. Imagine with a 1.5 inch heel, and no seam over the vamp. These are Betts ‘Roustabout’. 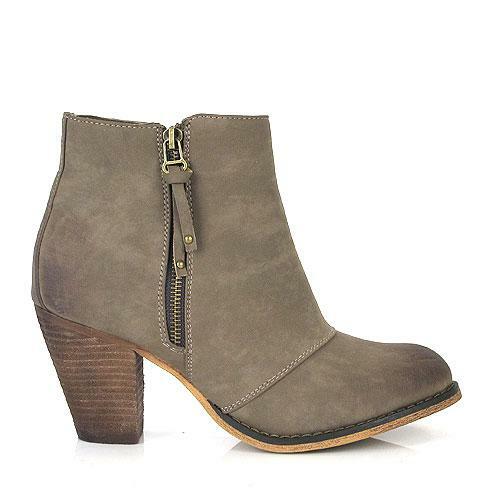 They have zips on both sides, and are a lovely neutral nougat with a dark stacked heel. I bought the Berlin style. The lower heel will be great for running around in while the almond shaped toe saves them from being too masculine. I also liked the ‘Alamo‘. I am fond of a slouch top on an ankle boot because they are very forgiving when you have to tuck your jeans inside them, but I’d have to check that those heels aren’t cunningly crafted rubber. Betts ‘Alamo’. Love the slouch. Oh who am I kidding. They’re fabulous. Utterly utterly fabulous.